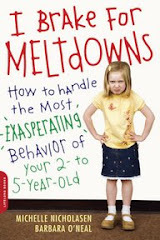 I Brake For Meltdowns: I Got Lice for Mother's Day, How 'Bout You? I Got Lice for Mother's Day, How 'Bout You? More hair issues. This weekend I got certified as a mother of school-aged children. My son was sent home from kindergarten with "nits," which were handed to me in a ziploc bag as I left the school. The bag contained two strands of his hair, each shaft carrying an ever so tiny black dot. You have got to be kidding, I thought. There's no way I can find these things. Luckily I had been preparing for this day, that is, when I wasn't dreading it. My girls happen to have a nit-picking expert for a school nurse, and she had sent home a training manual in the winter, with a nifty fine-toothed comb from Argentina (!) that would take away all the bugs without having to use chemicals or wash or vacuum. I was waiting for this day and finally it came. I found lice on everyone, including myself, but not my husband, triplet-J, or our au pair. Five cases total. Finding a live louse was kind of exciting and revolting all at once. First, it looked like a large freckle on my daughter's scalp. Then it looked like a tiny fruit fly caught under the hair. As I whisked the comb through, it picked up the dirty louse, and several more. As I examined the gray oval speck, which seemed to be vaguely moving, I was underwhelmed. I've waited all these years for YOU? After two comb-throughs with conditioner and a weekend wearing olive oil in our hair, we'll see what grade the school nurse gives me tomorrow. The bitty creatures are harmless, after all. In third world countries people just live with them in their hair, they co-habituate. (Body lice is a different story) In our culture it is absolutely unheard of to be relaxed about lice. To be fair, I got lovely Mother's Day gifts, too, such as leaf and flower "books", cards and drawings from my dear kidlets, who were remarkably compliant about sitting still for their combings. That was the best gift--being reminded how wonderful my children are.